The reason to start plants, or buy seedlings, is to get an early start on the season to maximize production and to give the little plants extra protection from the hostile elements that could shorten their life. If you start your own plants you should start about 20% more seeds than you need, because there will be some that fail to sprout or be deformed, so the extra will help cover any loses. 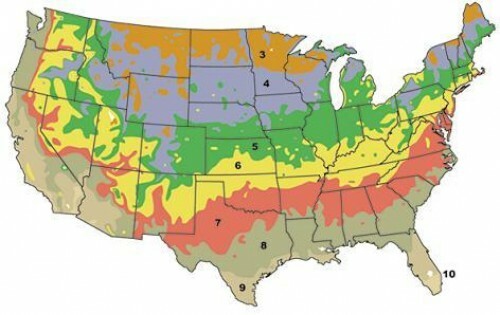 The rule of thumb is to plant seeds indoors about six weeks before the last expected frost date in your area (see zone map below) and any longer than this is really not necessary; plus your plants might outgrow their containers making them weak. Starting plants is not just a springtime event; I start plants all season long to have seedlings available to fill in bare spots. These dates are averages and zone maps can differ depending on who made them. You should check with a local Garden Center or County Agent to better understand the climate in your area. You do not want to start large seeds such as corn, beans and peas indoors or in containers, because they sprout easier than the smaller seeds, plus they do not require a jump on the season and are usually planted in mass, so you would need a huge amount of containers. Carrot roots are the part you eat and although the seeds are small, you do not start them indoors because transplanting them will warp the root and you’ll get an odd shaped product that is difficult to process, if you get anything worth eating at all. Beets would be an exception as they do just fine as transplants. Staring plants from seed can be a tedious job and the little plants require almost constant attention because they are so delicate that they can be annihilated in a matter of minutes from insect or weather damage. Most of the Garden Centers are limited on the varieties of vegetable plants they have and you may not find what you’re looking for. If you plan to buy seedlings, try to get them as soon as you can to get the healthiest plants and if the roots grow to fill the pot you can transplant them into a lager one until it is safe to put them in the garden. If you do not find warm weather plants (tomatoes, peppers) for sale at the garden center, ask them if they have them in the greenhouse that you can purchase now, letting them know you are aware they will have to be kept out of the cold for a few weeks. It is very rewarding to start your own plants, but keep in mind the care they will demand and if you are a beginner, I recommend you buy most of your plants. You will never get 100% of the seeds you plant to sprout and be healthy seedlings; especially if the seeds are from last year. By the way, check the date on the back of the seed package before you buy them, because the current year’s seeds are best and as seeds age the sprouting percentage goes down significantly. I use a method that helps me select the best sprouts to go into the container they will grow in (seed video). I take a dinner plate and lay a paper towel, or tissue, on the plate and then wet the paper; then drain off the excess water. Be sure the paper does not have additives such as lotions or fragrances that might inhibit sprouting. Then I sprinkle the seeds (don’t crowd them) on the paper and cover them with another piece of tissue; then cover the plate with plastic wrap to keep them moist because if they dry out even once, they will most likely die. I sow enough seed for what I will need for now and save the rest for planting a second, or third, crop later. I place the plate in a warm spot until they sprout. Some will take a week or more to sprout, but most will sprout in a few days, so check them every day and be prepared to transplant them into pots. When the sprouts are standing up above the tissue paper, I select the healthiest looking ones; gently removing them from the paper by grasping the leaf, not the stem or you will crush it, or lifting them with a flat implement like a plastic knife and plant them in the containers with potting soil. Be careful not to pull so hard that you tear the roots off and wetting the paper again will help loosen them and a little tissue paper stuck to the root will not harm them. After three weeks, any seeds that haven’t sprouted are not likely to do so (read the package) and you can throw these away. What I like most about this method is that I can be sure of exactly what will occupy every container of soil — one good, healthy seedling per container. If I just planted the seeds in the containers I would have to plant at least two seeds per container to help overcome the odds of seed failure. Some would have one seedling, some two or three and some with none. Then I would have to transplant the extra seedling into the container with none or to replace a sickly looking seedling; thereby increasing the risk of damaging both plants. 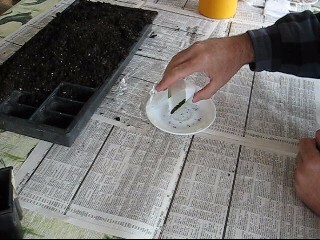 This is the traditional method and I do plant some seeds this way, but I start most of my seeds using the wet tissue paper. The tissue paper method requires a watchful eye, because as soon as the seedlings stand up; you must move them to a container of soil within a day or two, or they will become spindly, weak and the roots will be entangled. 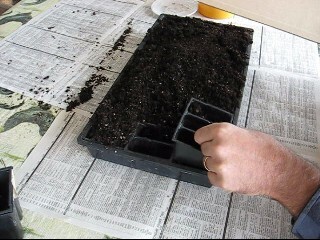 So if you do not have the time for this method, or have an abundance of seeds; sow them directly into soil-filled containers as directed on the package. Regardless of which method you use; it is wise to have a few extra seedlings on hand in the event one or two get damaged. Whichever container you choose to use to grow your plants; they require a rich soil and enough space for good root growth. I buy potting soil because garden soil tends to be too harsh on the little plants and bagged potting soils are usually free of insects and diseases. The plastic trays that plants come in at the garden center can be saved and reused the following year as long as they are clean in order to prevent disease. There are many types of starter kits on the market, but because I buy some plants every year and save the containers I have enough on hand to start my own seedlings. These packets come in a variety of sizes, typically in six-packs consisting of six cells per packet and in a tray (or flat) of twelve packs, so a flat of six-packs can grow 72 seedlings. Depending on what you are going to grow and how long they will be in the packets, will determine which size to use, but most do just fine in the standard six-pack cell. Any nurseryman will tell you that 90% of plant failure is a direct result of water supply, ether not enough or too much. I water my seedlings before setting them outside for the day by bottom watering which is done by setting the packets in a tray of water for about five minutes to allow the soil to soak up the water. Bottom watering helps keep the nutrients from being washed out of the soil and this watering method also helps prevent a fungal disease known as damping-off. This disease usually strikes during the night so avoid late watering if you can. I set my trays out during the day if the temperature is at least 45 degrees and place them in an area that is mostly sunny but shaded or dappled light in the afternoon to keep the cells from drying out, as they will do rapidly on a warm day. I bring them in at night to prevent damage from frost or animal marauders and damping-off. After a few weeks they can be outside at all times, unless there is a frost or severe weather in the forecast. Keep a water source next to them at all times so you can give them a quick drink if needed. The best situation would be to have some form of a greenhouse to control the atmosphere the seedling will be in. The plastic cover of the starter kits will be helpful for the first week of growth, but the seedlings will quickly outgrow this cover and it might make the little things too delicate to put outside on a windy day. I get my seedlings outside in the sun and gentle winds when they first pop-up out of the soil, or as soon as possible to strengthen them for the garden; sometimes that is just one day a week, but it makes a tremendous difference. If you start your plants indoors and cannot get them outside soon, then keep them away from excessive heat and if grown near or in a window, they will lean toward the light so something reflective such as a mirror on the opposite side will help balance the lighting. Artificial lighting is great, but the systems can be cost prohibitive. 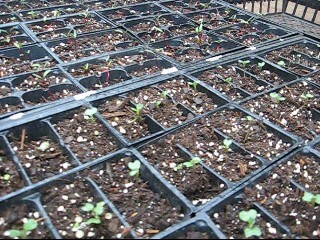 The sooner you can get the seedlings outside to get sunlight, the better the will grow. Note: If you grow them indoors for a week and set them out in direct sunlight they might get sunburned; so put them in the shade for a few days before moving to a full sun area.